This chapter deals with the role that the Court of Justice of the European Union (ECJ) plays in the protection of human rights within the EU and, in particular, its stance vis-à-vis the European Convention of Human Rights (ECHR) and reconstructs the changing role of the Convention. It starts by recalling the process of development of fundamental rights as a counterweight to intrusions into the individual rights by directly applicable EU law, in which the ECJ used the ECHR as a primary source of inspiration. In the course of this process, the ECJ responded to the competing jurisdiction on fundamental rights of member state constitutional and supreme courts, which had formulated claims of reserved jurisdiction. After the codification of ECJ’s jurisprudence by the EU Charter of Fundamental Rights and its entry into force as binding law, however, the contribution argues that a new phase has begun. Not only does the Court now tend to manifest its claim to exclusive jurisdiction on fundamental rights within the whole field of application of EU law vis-à-vis member states’ judiciaries. It also defends this claim against the European Court of Human Rights by rejecting the EU’s envisaged accession to the ECHR. 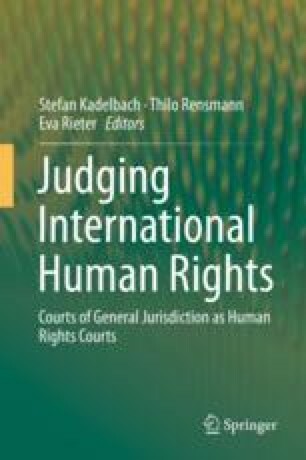 A final section of the paper briefly looks at the ECJ’s jurisprudence on other international human rights treaties.